The first tank actions in the South West Pacific were at the Buna area of operations on Papua north coast mid-December 1942. This Australian unit, the 2/6 Armoured Regiment (AR) were equipped with US Stuart / Honey M3 light tanks. 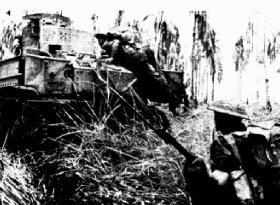 General Clowes ordered to send one troop of tanks to Oro Bay, or Pongani, from a squadron of 2/6AR then arriving at Milne Bay. The lack of shipping defeated this plan for when the first tank was loaded on the only available craft, a Japanese landing barge, both vessel and Stuart tank overturned and sank. By early-December the Dutch merchant ship Karsik had brought four tanks of Capt Whitehead's ‘C Squadron from Port Moresby, to be joined by four more arriving direct from Australia, the leading elements of Maj Tye’s ‘B Squadron, at Milne Bay on the eastern tip of Papua. The courage and ingenuity of these officers, such as Colonel Hodgson the armoured regiment commander, and other servicemen in getting these clumsy 14ton armoured vehicles shuttled forward around the jungle fringed coast is a story in itself. Motor Launches towed clumsy barges that had been loaded with a Stuart at Oro Bay, had water lapping a mere 2inch freeboard as the escorted convoy made its way up the coast then swinging in close to inshore as possible, cast off the barge leaving the tank to get on shore by driving over the edge with a lurch and splash. Once ashore they followed the beach with one track in the shallow surf backwash and the other above the water line so that the track marks would wash away while proceeding to the assembly area. On 18 December 1942 the 2/9 Battalion (Btn) and eight tanks from ‘C Squadron 2/6AR began the attack through Duropa Plantation against enemy positions at Cape Endaiadere. This terrain was most suitable for closed topped and tracked AFV’s in the whole Buna area, yet within this restricted sector the Stuart tanks were like racehorses harnessed to a heavy plough. Among the high coarse kunai grass, through the swamp and mud, over bombcraters and shell holes in which marshy liquid morass emanated the few Stuarts could merely grind along in their lowest gear at the pace of a walking foot soldier. The casualties both to men and tanks were discouraging but moving forward with the risk of a limited front they pierced through the stubborn enemy resistance that held up attempts to advance for several weeks. Whitehead was badly wounded by a Japanese soldier jumping onto the tank shooting the rifle at blank range into the vision slit, bleeding the captain was removed from his tank and the C/O Hodgson took the battle commanders duty plunging back into the clash of arms. Leading by looking out of the open hatch on the turret, true to the teachings, to get a full view of what lay ahead, then an inevitable fate hit him when a machine-gun burst splattered the armoured vehicle. Another Stuart had bellied on a fallen coconut log and the cheeky Japanese lit fires under it with the tank crew squirting their fire-extinguishers through the apertures in a vain attempt to discourage the enemy. The Australian tank crew were saved by the timely arrival of Corporal Barnet’s tank and his gunner virtually aiming at the stricken armoured vehicle sprayed the vicinity with machine-gun fire. By noon Cape Endaiadere had been reached and the tanks needing to be refuelled withdrew to the shelter of the scrub. By 1.30pm the depleted attacking tank force of the 2/9Btn turned west towards Strip Point advancing parallel to Simemi Creek north of the old strip and the initial movement of the assault never wavered. 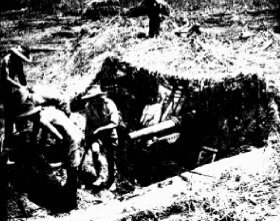 The advance overcame strong enemy pillboxes mutually supported and carefully concealed then for the next few days with two Stuarts the 2/9Btn cleared the east bank of the creek with time mostly taken up by brief encounters with small Japanese pockets of defiance. US Army Colonel Alexander MacNab’s IIIrd (Battalion) /128th Infantry Regiment (IR) followed up linking with the isolated US I/126IR half occupying the west end of the new strip and later when a nest of bunkers at the east end of the old airstrip held up the infantry. Here the dissipated Australian tank force were called into overcome this resistance of withering fire from anti-aircraft shells and numerous calibre guns sighted over the kunai grass filled ground of the old airstrip, covered in a warren of entrenchments and strongpoints interlinked with several lines of bunkers extending from Simemi Creek to the swamp. These four remaining M3 Honeys’ were stirring forward concentrating on searching for a pom-pom gun known to be sited in the west end of the old airstrip. Suddenly a flash to port of the four tank formation, then another and the left side of Lieut McCrohon’s Stuart split open disabling the steering and causing the tracked war-machine to ditch in a crater. The Japanese gunner took a shot at Barnets tank crashing it through the turret, then next Sergeant Lattimors tank and the shot found the hull gunners flap. Lastly, in this orderly procession of destruction, Sergeant Church’s tank was knocked out with a quick volley and the infantry now denuded of their armour were left to bare the venomous Japanese firepower. The infantry of 2/10Btn for the next three days moved west to Simeni Creek from positions on the new strip, established a bridgehead over the brackish stream in the rear of the Japanese position on the old strip and American engineers under a brave and tireless young 2Lieut Doughtie worked repairing the rickety bridge for passage of both soldiers and tanks. Across the creek the Diggers caught the headquarters element sited there and within a very short time, about 20 vital Japanese military personnel, were struck down. They also had to battle their way forward to bring up a field-gun for close support. Sergeant Carson was in charge of this 25pdr gun –‘Freddie One, in the bush off the southern side of the new airstrip, and took it’s new name by which it was to become famous at Buna –‘Carson's Gun’. And was now proving spectacularly successful in a bold experimental role, with Maj Hall the commander of the 2/5FldRgt Battery spotting from the heights of a 70ft banyan tree. Using an armour-piercing round on a sighted Japanese pillbox, in preference to high explosive to lessen the danger to allied infantry spread close by the target, the first round disappeared through the square embrasure and with a flash of flame alighted up the darkness of the aperture. The solid-shot had carried away the breech mechanism of a dated Japanese 75mm gun, which the strongpoint sheltered and soon afterwards a two-day duel with a 25mm piece, which gave back rather more than it took. During the ensuing days of skirmishing clearing the old airstrip the balance of ‘B Squadron, 2/6AR, had been shuttled around from Milne Bay under Maj Tye. Then Brig Wootten warned him his service would be needed and he had these four tanks waiting and ready next morning for a big push. His other seven repaired and remaining Stuarts under Capt May, his second in command, at the new strip were to move up into the attack. In this failed set-back only one tank was in continuous action, one disabled, one became unserviceable, one was on its way to the frontline, two were still bogged while two were trying to help them out and three were still in the reserve area. But the tanks however had no monopoly of mistakes that day, an attack with such a background and the decision to go ahead was foredoomed. They had not been designed as infantry tanks nor the crews trained and experienced for this role, neither had the infantry been drilled to grind with tanks across this type of terrain against this enemy of the Crown, so both had to improvise in the midst of battle. Then on New Years Day 1943 the fresh 2/12Btn, with the US III/128IR on the right, attacked towards the coast on a narrow front, with the 2/9Btn supporting fire from across the eastern bank of the Simemi Creek. The tanks crossed the kunai covered ground first then with infantry closing upon them fast, packing the rear flank of the armour which had orders to conform to the walking pace of the foot soldiers. 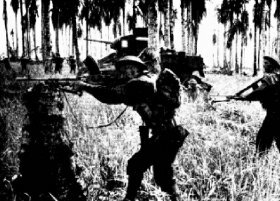 Australian-made Vickers water-cooled machine-gun support fire from the flanks whipped through the coconut palms and flailed across the long kunai ahead of the wary and measured manoeuvres. There was brave and bloody work through the scrub and thick vines tangled and intermingling with the swamp which oozed from the creek, where the Stuarts could not tread on treacherous ground the infantry winkled out the posts alone. The groups of infantry fired flaring very lights at targets to guide suppression tank main and secondary gun-fire then as they threw grenades did sweeping rushes, with hand to hand combat inflicted heavy casualties against the strongpoints that fringed the beach line and the combined force broke through reaching the coast by nightfall. On the following day the 2/12Btn neutralised scattered remnants of the enemy and contact was made with the left flank force operating towards Buna Mission across the Girua River. Despite the formidable defence the Japanese east of Giropa Point were completely wiped out, nine hundred were known to be buried there and as always the unknown missing can only be guessed.